BUNTING "CELEBRATE" TAG: glue a bit of baker’s twine to a tag or card. Cut out a few triangles from a cupcake paper and glue them onto the twine. Stamp on a name or message. ICE CREAM CONE: Cut out a little triangle from a cupcake paper for the cone. Add confetti circles (or punch or hand-cut dots) for the scoops and cherry. Glue the dots to the card, and then glue on the cone. Layered hearts- Gather 3 or 4 cupcake papers in assorted sizes. Cut through a slit on one ridged side to the center. Use this as the top center and cut into a heart shape. Repeat with the other sizes. Glue the largest heart to the card and glue the other hearts on top in descending sizes. Rubber-stamp an initial in the center of the top heart. Tie some bakers twine to the bottom of the card. 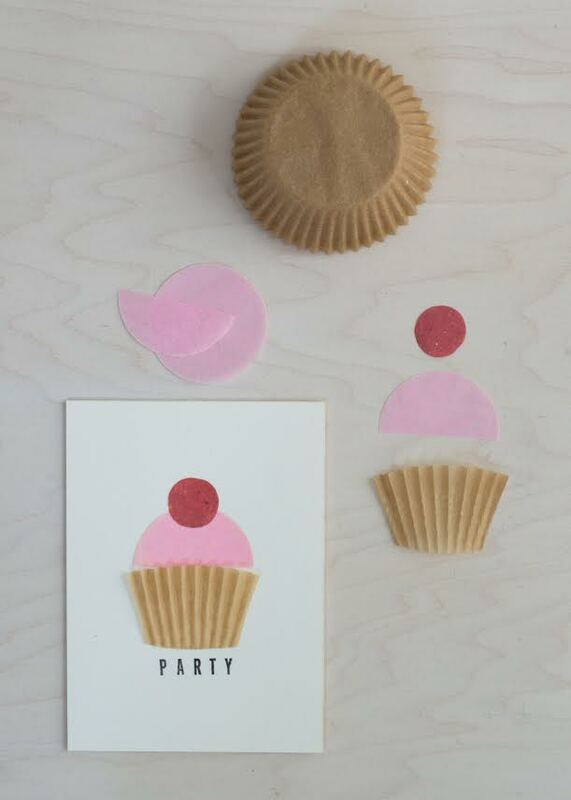 Cupcake: Cupcake papers work well for making, well, cupcakes! Snip out a little square, leaving the rounded top. I used confetti circles cut in half for my cake and cherry but you could punch or hand-cut the dots. These make cute party invites. Heart tulip-y flower tag: fold cupcake paper in half and then in thirds. With scissors, round the top open edge and cut into the sides. Spread the petals apart to stagger them. Leaf and stem: Cut a ¼ or so off a green cupcake paper. Cut and almond/leaf shape, against the ridges, and fold in half. Use a scrap to cut a stem. glue the flower, stem, and leaf onto a tag or card. 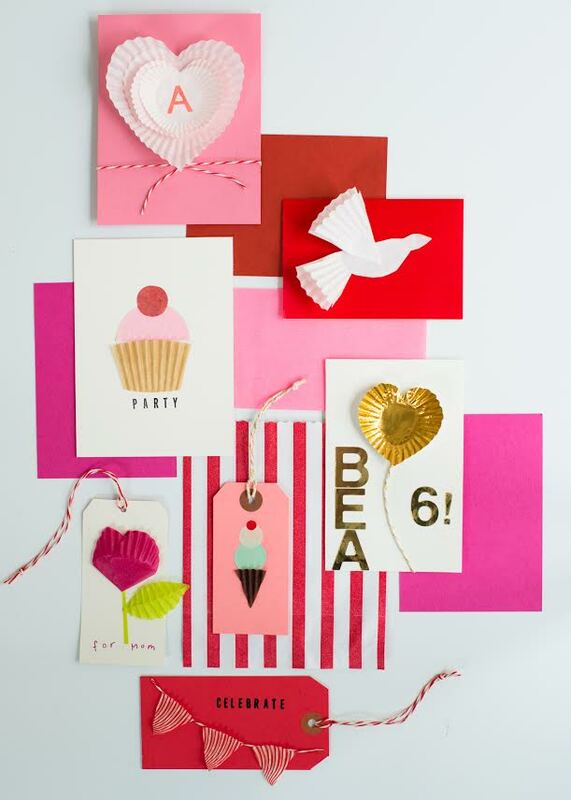 For more cupcake paper crafts pick up our book, Paper Goods Crafts!